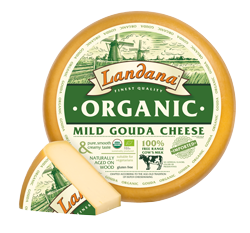 Landana ORGANIC is made with free range Dutch cow’s milk, according to Dutch cheesemakers’ tradition, and is naturally aged for at least 8 weeks. Because of its pure, smooth and incredible creamy taste, this semi-hard cheese has been awarded with gold at the Global Cheese Awards, right after its introduction. Landana ORGANIC contains no artificial flavors, colors or preservatives and is suitable for vegetarians and gluten-free diets.